Take this well maintained 65 ft Ketch (Caraid of Hobart built of Kauri the traditional way in Hobart in 1950) and saunter out from the wharf behind Cafe de Village adjacent to the Grande Hotel and Casino, out through all the anchored yachts and pass Iririki Island on your way to the furthermost Harbour boundary heading into the setting sun. 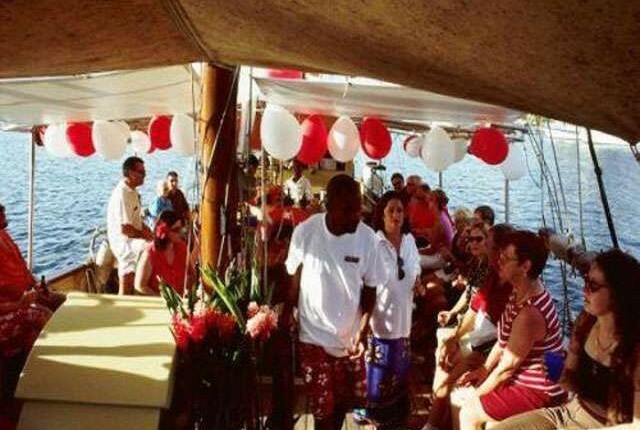 This relaxing sunset cruise is suitable for the whole family but equally enjoyable if you are a couple or with a small or large groups of friends. Enjoy a glass of wine or soft drink and some great finger food along the way as you pass Resorts and beaches along the Harbour edge. 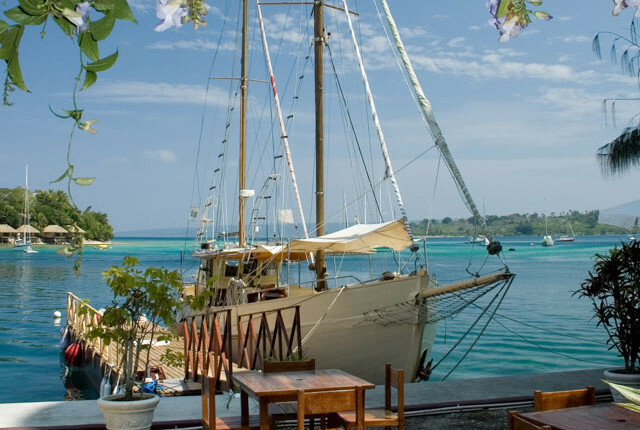 The atmosphere is one you will never forget and the ambience of the experience puts you in another world for a couple of hours where you just relax and enjoy the picturesque views, the slowness that we all enjoy day in and day out on this amazing old vessel. 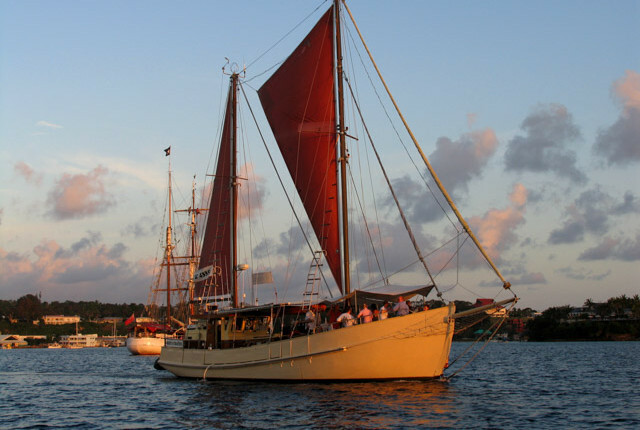 This stunning tour of the harbour and Mele Bay includes food and drinks. They supply Champagne, red and white wines, beer, orange juice and freshly made finger foods. You will receive 3 Drinks included in the price with additional available for purchase at very reasonable prices. Caraid is available for exclusive charter please email us for details. 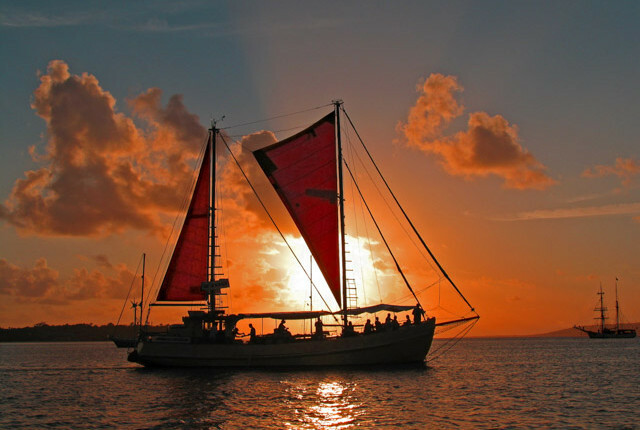 The Harbour Sunset Cruise is not to be missed. The dress code is a casual relaxing one, and be sure to bring along your Camera. Arrive at least 15 minutes before departure, the cruise leaves on time and will not wait for late comers. If you require additional drinks over and above what is included, these can be purchased on board at a fair price. The Sunset Cruise departs from the wharf adjacent to the Grande Hotel. Just walk in behind the massage shops and meet our staff at the Boat 15 minutes before departure.